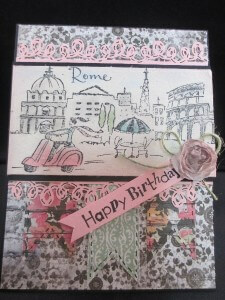 Today I am making this card to enter in a challenge for Penny Black stamps , I saw this stamp and had to get it , the name of the stamp is ROME , so cute !! 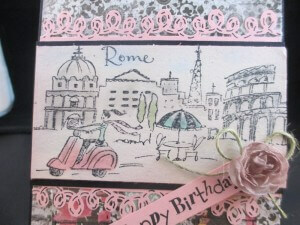 inside I added washi tape ( my first time using , I like it ) , Micheal’s had it two spools of 1.49 , worth buying to try . Very cute! I’ll have to look for that stamp! 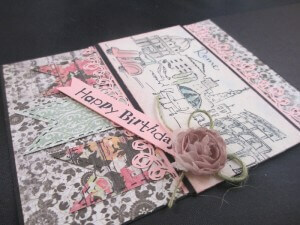 Lovely use of that great Penny Black image and so very pretty and delicate. 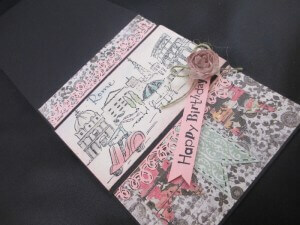 Thanks so much as sharing with us at Penny Black and More challenge. Can you make sure you mention and link back to us to be eligible for the prizes on offer. If you’re not sure how you do this you will find instructions on our blog.